Documentary filmmaker Kathleen McNamara's love for music comes naturally having grown up in the San Francisco Bay Area in the 1960s and '70s. She soon traded Belmont for the University of Oregon where she got a degree in art history and humanities. After working in fundraising and development for several Bay Area non-profit organizations (including KQED & the Academy of Sciences), McNamara and her husband moved to Alexandria, Egypt where she taught landscape painting workshops. Upon returning home McNamara turned to filmmaking with the desire to document musical performance and apprenticed with local filmmakers Lise Swenson and Todd Wilson. 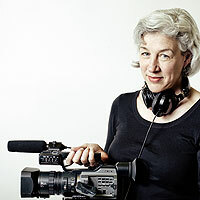 In 2004, she founded Academy Avenue Films, creating A Bloody Show: John Wesley Harding & Friends, Live at Bumbershoot 2005, a one-of-a-kind performance documentary featuring an accapella trio, a string quartet, and a rock band with narration by musician Robin Hitchcock. Her search to understand the inequities of the music industry resulted in her second documentary, Why Isn't Chris von Sneidern Famous? which was completed in 2009. Currently, she is working on several short films and learning to play the bass guitar with her cover band, The Insufferables.